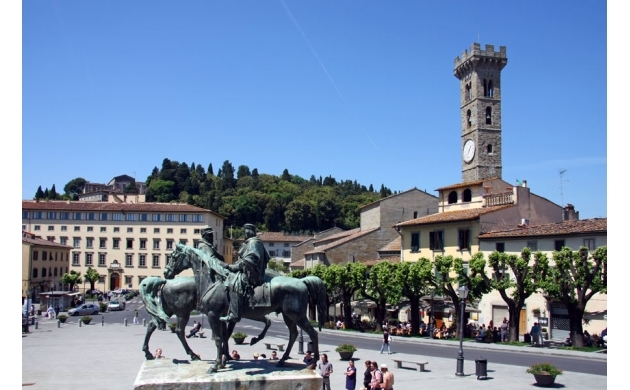 When the weather gets too hot in downtown Florence, or the crowds simply become too much to bear, it might be time for a relaxing day trip up the hill to the charming little town of Fiesole. Located a quick 15 minute bus ride away, or a slightly challenging uphill walk, the former Etruscan settlement sits tranquilly perched above the lively city of Florence below. Come up for the views, the fresh breezes from Monte Ceceri, and to see some interesting Roman-Etruscan ruins. 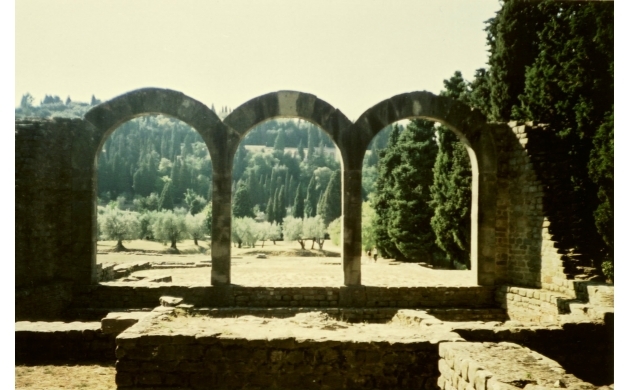 The ancient origins of the town of Fiesole go all the way back to Etruscan times when the city was an important part of the federation of that advanced pre-Roman civilization. 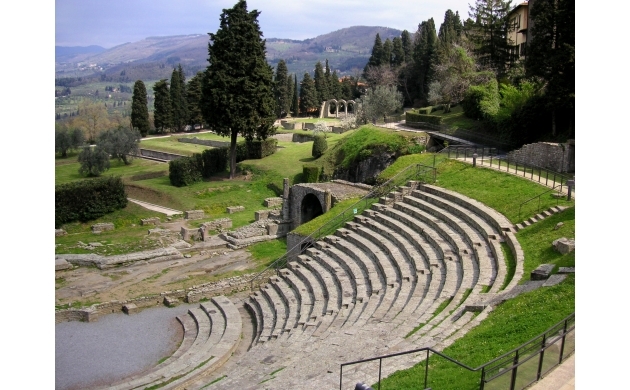 Conquered by the Romans in 283 BC, Fiesole was an independent city for many centuries during the Middle Ages before it was conquered by Florence in 1125. Over the course of the past centuries, many of the leading noble families of Florence have built their magnificent villas along the hill going up to Fiesole. In fact, if one takes the 8 kilometer walk from the city center, passing the little hamlet of San Domenico and continuing up the Via Vecchia Fiesolana, it is possible to get a glimpse of many of these palatial compounds where the richest families of Florence built their residences - including the fabulous multi-tiered compound of the Villa Medici. Arriving in the main square of Fiesole, Piazza Mino, the first thing one can do is to take a moment and admire the quaint beauty of the little town itself, with its classic bell tower visible even from the city below. The inspiring Etruscan-Roman Archaeological Area is just around the corner from the piazza, and has a well preserved amphitheater that in the summertime also hosts magical outdoor concerts. Be sure to have a prosecco in the adjoining bar while admiring the stunning views over the ruins framed by the rolling Tuscan hills in the background. The Cathedral of Fiesole is also worth a quick visit. 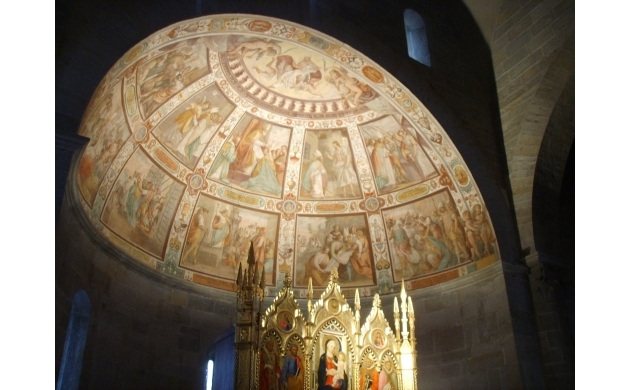 It houses the remains of Saint Romulus, who, according to legend, was the very first bishop of Fiesole. Taking a walk up the steep cobblestone road leading to the Monastery of San Francesco, visitors can stop and admire the spectacular views from the crest of the hill, looking down over the wonders of Florence. In the evening, the sunset view is breathtaking. Another option for the adventurous traveler is to follow Via Verdi (to the right of the piazza) to the panoramic zone, passing the former house of the architect Frank Lloyd Wright, for more spectacular views. Continue on to explore the trails through the park of Monte Ceceri, where Leonardo da Vinci first tested his famous flying machine! After all that walking it might be time for a drink and a bite to eat. There are numerous cafes and bars in Fiesole's main square where you can have a nibble and maybe a glass of wine or, better yet, try a Negroni - it was invented in Florence, after all. There are also some excellent dining options with amazing views - Terazza 45 near the piazza has a stunning terrace, while La Loggia degli Etruschi up the hill toward the monastery is also a real treat. On the first Sunday of every month, Fiesole also hosts an antique market in the main square, with various other markets taking place pretty much every other weekend. The easiest option is to take the ATAF n°7 bus from Piazza San Marco. The end of the line is the main square in Fiesole. The ride takes around 15-20 minutes, and is a rather picturesque journey. Alternatively there are the open-topped tourist buses that come to Fiesole. Or you can be a real trooper and walk straight up the hill. Then you can reward yourself with a giant plate of pasta and a bottle of Chianti - guilt free! The Etruscan-Roman Archaeological Area is open from 9:30 to 7pm in the summer and 9:30 to 5pm in the winter. Closed on Tuesdays during the winter months only.